I am almost never on IRC, because #free_irc_clients_4_windows_that_will_notify_on_activity = 0. Yes, I have tried all of them. So, it would be nice to have an IRC browser client that will change the browser tab's title if there is any activity. I have seen those on other FLOSS projects, so it's theoretically possible. 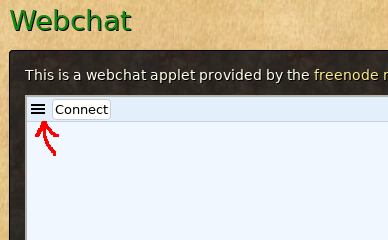 For some reason i couldn't open the options if our webchat interface is shown like it is. If i open the iframe in another tab the options could be opened. Finally found an IRC client that works (thanks, Hasi! ), so this is low priority now. Using kiwiIRC (https://kiwiirc.com/) as our website widget, as you mentioned on irc, should be considered. - kiwiIRC does not protect bots from joining the irc network. The widget we use does this automatically by using the google re-captcha-v2. - The main reason to make IRC chatting possible on our site is just a try to get users in realtime contact with the community/developers in an easy way without much knowledge of IRC. In the page showing the chat, we could add an additional link to a wiki page containing additional information to IRC in general and links to clients. E.g. adding a link to Quassel. Having a CAPTCHA is indeed important. I'll post here again if I run into a webclient that has both features. I think that adding a list of good IRC clients is the best solution for now. Launchpad will hide "Opinion" bugs from the list, so I'll set this to incomplete - otherwise, we will never find this bug again.